in different fields of study for Bachelors, and Masters. you can apply for BS - Bachelor of Science, MS - Master of Science, . 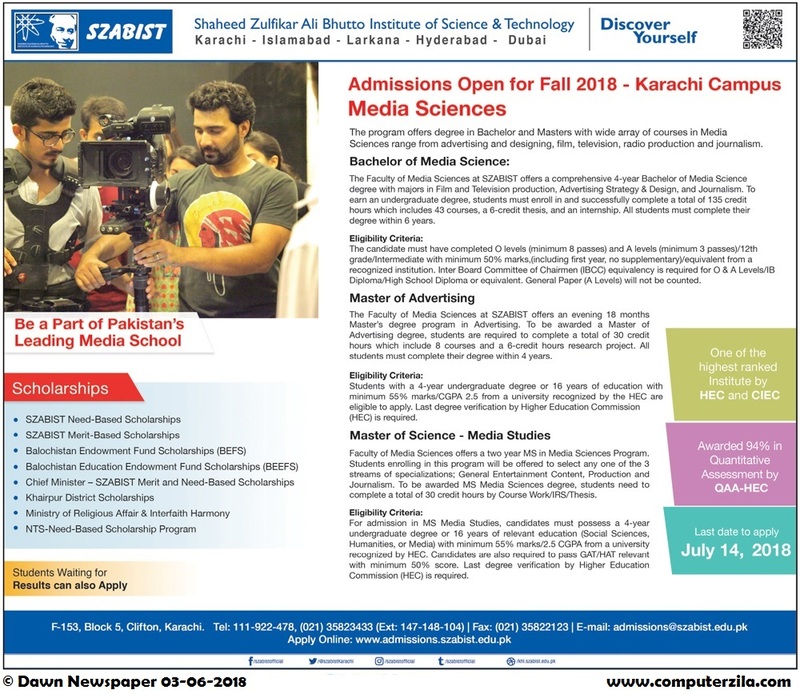 SZABIST Offers A Wide Range Of Undergraduate, Graduate And Postgraduate Courses In Various Fields Of Media Studies. SZABIST one of the highest ranked institute by HEC and CIEC. Also offers Need and Merit Based Scholarship, NTS Scholarship, Balochistan Endowment Fund Scholarships (BEFS), Balochistan Education Endowment Fund Scholarships (BEEFS), Chief Minister - SZABIST Merit and Need Based Scholarship, Khairpur District Scholarship. O/ A level, or Intermediate with 50% marks.